"These big Snowball blocks go together quickly—just stitch small squares diagonally in the corners of each large square to make contrasting corner triangles. Frame a lap-size quilt with playful pieced borders, as shown here. 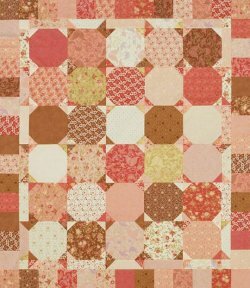 These fabrics are from the Gypsy Rose collection by Fig Tree Quilts for Moda Fabrics."